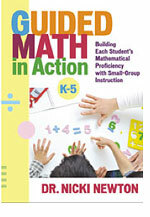 As many of you begin the new year and are thinking about the set-up of math workshop, here is a great page that has excellent examples of mini-lessons. Remember that a mini-lesson is supposed to be just that – Mini! (7 to 12 minutes). There is wiggle room here depending on what you are doing. But, way too often we fall into doing Maxi lessons that last 20 to 45 minutes! So keep it short, to the point and engaging!